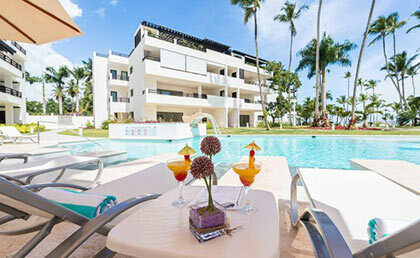 Aligio Apart-hotel & Spa is a magnificent apartment complex located on the beautiful beach of Las Terrenas, on the Samana Peninsula, one of the most beautiful tourist destinations in the Dominican Republic. 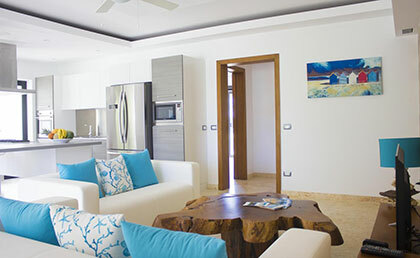 Aligio Apart-hotel has 77 luxury apartments, are distributed around two swimming pools with Jacuzzi. 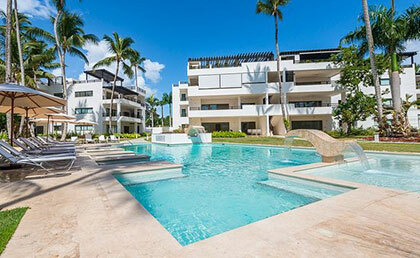 Aligio Apar-hotel is located in a huge tropical landscape, the Aligio thus associates superior quality apartments with the services of a luxury hotel. 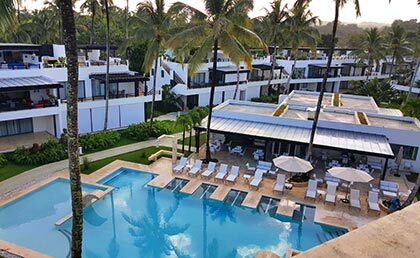 Its spa, its reception and concierge, the spaces for relaxation as well as the bars of the pools and the beach guarantee you an exceptional stays in Las Terrenas. The residence Aligio also offers all the comforts that make your life easier: a valet parking service, 24 hour security, guarded parking that includes 59 garages. 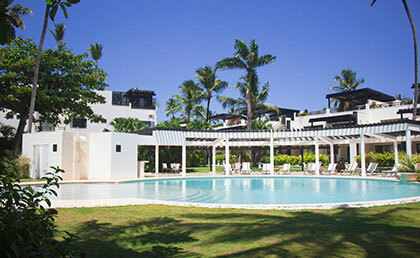 An apart-hotel without comparison in Las Terrenas! On the other hand, the Aligio residence is part of a unique line of respect for the environment in Las Terrenas, thanks to the use of solar energy that covers all electricity consumption and a rainwater recovery system. All with the aim of controlling costs and reducing costs responsibly! Thus, you are in harmony with nature while enjoying an omnipresent comfort. Give life to your project in all serenity! 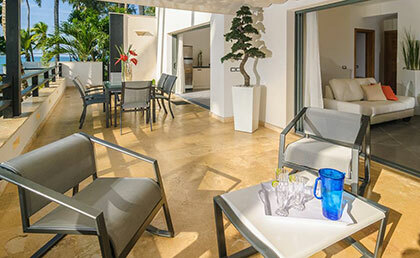 Finally, the team in charge of the project, directed by Stewart Puppo that has developed several reference projects in the region, is recognized for its professionalism and the quality of its products..
Aligio Apart-Hotel has a restaurant, a bar and a wellness center to enjoy a vacation in Las Terrenas. It is perfectly located close to everything, shops, restaurants, bars, clubs ... and in front of the beautiful beach of the village. The beaches of Punta Popy, Las Ballenas, Bonita, Cosón are just a few minutes away by car. - Italian kitchen equipped with appliances (refrigerator, oven, stove) in stainless steel. The extractor is optional. - Jacuzzi (for the penthouses). To furnish your apartment, we also offer our catalog of furniture (1 room, 2 rooms, 3 rooms), at the rates negotiated especially for our customers.